2018 Council Summer Classic Registration CLOSES TONIGHT at 10 pm! 2018 Council Summer Classic Registration CLOSES TONIGHT at 10 pm for Pre-Registration! 2018 Council Summer Classic Registration CLOSES at 10 pm TONIGHT for Pre-Registration! 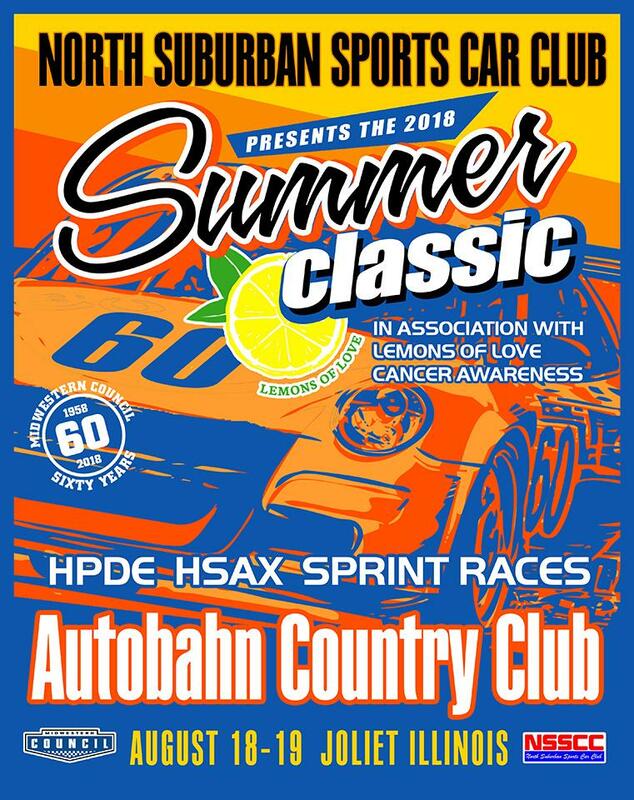 North Suburban Sports Car Club (NSSCC) presents the Midwestern Council 2018 Summer Classic in association with LEMONS OF LOVE Cancer Awareness; as well as the 2nd ANNUAL BEN MCCARTER CUP! Come join us for CARS, COFFEE, and RACING on Saturday, August 18. We'll be hosting a 2 day car show in addition to morning HPDE practice and afternoon High-Speed Autocross timed runs where the fastest lap will again take home the coveted Ben McCarter Cup trophy (FASTEST HSAX TIME OF THE DAY) and Prize Money! Volunteer Workers are needed and appreciated for this event. Come enjoy a day at the track and help us put on a great event. Free coffee and donuts in the morning plus free lunch and other perks. Sign up here on MotorSportReg and pick your favorite specialty! Come join us for CARS, COFFEE, and RACING on Sunday, August 19. We'll be hosting a 2 day car show (Aug 18-19) in addition to the Midwestern Council Sprint Race 8! Also included in entry for Sprint Racers will be a Saturday, August 18 afternoon Test & Tune on the North Course.